Object-oriented programming differs from traditional procedural programming by examining the objects that are part of a system. Each object is a computer representation of some actual thing or event. 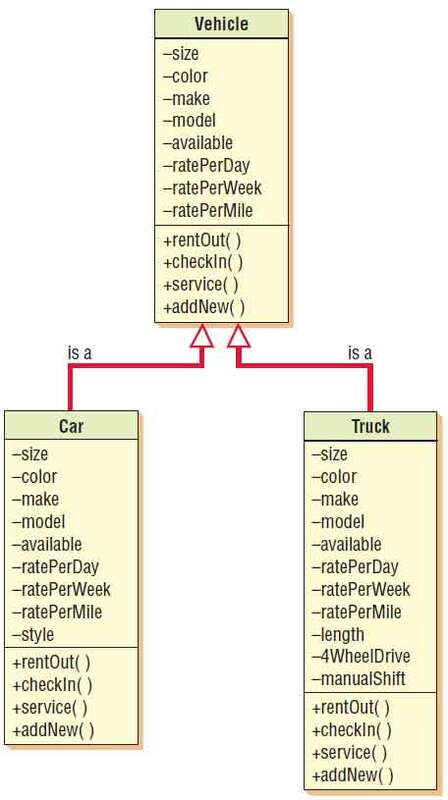 General descriptions of the key object-oriented concepts of objects, classes, and inheritance are presented in this section, with further details on other UML concepts introduced later in this chapter. Objects are persons, places, or things that are relevant to the system we are analyzing. Object-oriented systems describe entities as objects. Typical objects may be customers, items, orders, and so on. Objects may also be GUI displays or text areas on the display. Objects are typically part of a group of similar items called classes. The desire to place items into classes is not new. Describing the world as being made up of animals, vegetables, and minerals is an example of classification. The scientific approach includes classes of animals (such as mammals), and then divides the classes into subclasses (such as egg-laying animals and pouched mammals). The idea behind classes is to have a reference point and describe a specific object in terms of its similarities to or differences from members of its own class. In doing so, it is more efficient for someone to say, “The koala bear is a marsupial (or pouched animal) with a large round head and furry ears,” than it is to describe a koala bear by describing all of its characteristics as a mammal. It is more efficient to describe characteristics, appearance, and even behavior in this way. When you hear the word reusable in the object-oriented world, it means you can be more efficient, because you do not have to start at the beginning to describe an object every time it is needed for software development. Objects are represented by and grouped into classes that are optimal for reuse and maintainability. A class defines the set of shared attributes and behaviors found in each object in the class. For example, records for students in a course section have similar information stored for each student. The students could be said to make up a class (no pun intended). The values may be different for each student, but the type of information is the same. Programmers must define the various classes in the program they are writing. When the program runs, objects can be created from the established class. The term instantiate is used when an object is created from a class. For example, a program could instantiate a student named Peter Wellington as an object from the class labeled as student. What makes object-oriented programming, and thus object-oriented analysis and design, different from classical programming is the technique of putting all of an object’s attributes and methods within one self-contained structure, the class itself. This is a familiar occurrence in the physical world. For example, a packaged cake mix is analogous to a class since it has the ingredients as well as instructions on how to mix and bake the cake. A wool sweater is similar to a class because it has a label with care instructions sewn into it that caution you to wash it by hand and lay it flat to dry. Each class should have a name that differentiates it from all other classes. Class names are usually nouns or short phrases and begin with an uppercase letter. In figure illustrated below the class is called RentalCar. In UML, a class is drawn as a rectangle. The rectangle contains two other important features: a list of attributes and a series of methods. These items describe a class, the unit of analysis that is a large part of what we call object-oriented analysis and design. An example of a UML class. A class is depicted as a rectangle consisting of the class name, attributes, and methods. An attribute describes some property that is possessed by all objects of the class. Notice that the RentalCar class possesses the attributes of size, color, make, and model. All cars possess these attributes, but each car will have different values for its attributes. For example, a car can be blue, white, or some other color. Later on we will demonstrate that you can be more specific about the range of values for these properties.When specifying attributes, the first letter is usually lowercase. A method is an action that can be requested from any object of the class. Methods are the processes that a class knows to carry out. Methods are also called operations. For the class of RentalCar, rentOut(), checkIn(), and service() are examples of methods. When specifying methods, the first letter is usually lowercase. Another key concept of object-oriented systems is inheritance. Classes can have children; that is, one class can be created out of another class. In UML, the original—or parent—class is known as a base class. The child class is called a derived class. A derived class can be created in such a way that it will inherit all the attributes and behaviors of the base class. A derived class, however, may have additional attributes and behaviors. For example, there might be a Vehicle class for a car rental company that contains attributes such as size, color, and make. Inheritance reduces programming labor by using common objects easily. 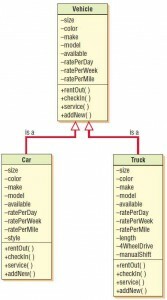 The programmer only needs to declare that the Car class inherits from the Vehicle class, and then provide any additional details about new attributes or behaviors that are unique to a car. All the attributes and behaviors of the Vehicle class are automatically and implicitly part of the Car class and require no additional programming. This enables the analyst to define once but use many times, and is similar to data that is in the third normal form, defined only once in one database table (as discussed in Chapter “Designing Databases”). 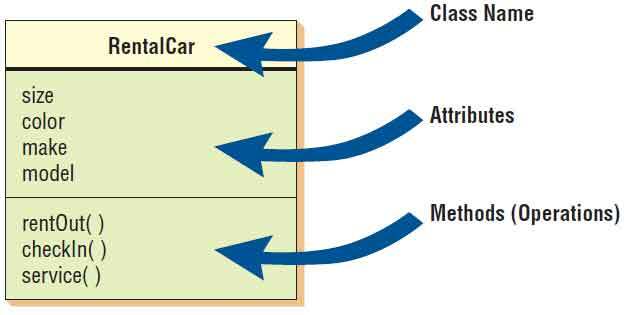 The derived classes shown in the figure below are Car or Truck. Here the attributes are preceded by minus signs and methods are preceded by plus signs. We will discuss this in more detail later in the chapter, but for now take note that the minus signs mean that these attributes are private (not shared with other classes) and these methods are public (may be invoked by other classes). A class diagram showing inheritance. Car and Truck are specific examples of vehicles and inherit the characteristics of the more general class, Vehicle. Program code reuse has been a part of structured systems development and programming languages (such as COBOL) for many years, and there have been subprograms that encapsulate data. Inheritance, however, is a feature that is only found in object-oriented systems.